"Turn Your Health Inside Out...!" Thanks for visiting Dr. Mark's Holistic Health website! Turn your health inside out! Here's my story in a nutshell: I have felt the grief and the crushing loss of self worth that come with losing a rewarding career because of my own poor health. For years, I fought crippling arthritis pain, along with the anger, fear and hopelessness that anyone who suffers from chronic disease knows all too well. When finally I decided to stop fighting and start thriving, I was able to transform my health and become a triathlete and marathon runner. I turned my health inside out! You’re not living life to the fullest because you have a health challenge that’s limiting you. You’re seeking a holistic solution to your challenge. Or, you may already be in good health but you want to learn how to live more of a holistic lifestyle. Quite likely, you have experienced frustration with conventional medicine and don’t have a high degree of trust in it. You are also frustrated with the insane complexity that's all over the world of health, and healthcare. You care – really care – about your overall health. You want to go beyond just treating your symptoms and enjoy vibrant health for years to come. DrMarks-Holistic-Health is still young; and in the coming days, weeks, months, and beyond, I plan to add a lot of great content on holistic health, healing, lifestyle, nutrition, fitness, children's wellness, news and other topics to help you turn your health inside out. Join my list to receive a FREE 63 page excerpt from Oby's Wisdom! 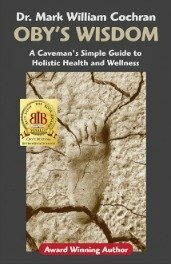 A Caveman's Simple Guide to Holistic Health and Wellness! This generous excerpt includes the complete introduction, two full chapters (including the entire chapter on nutrition), content from every chapter, and more. You will also receive Dr. Mark's Healthy Thoughts, via email, on a regular basis -- useful tips and brief snippets designed to help you turn your health inside out.